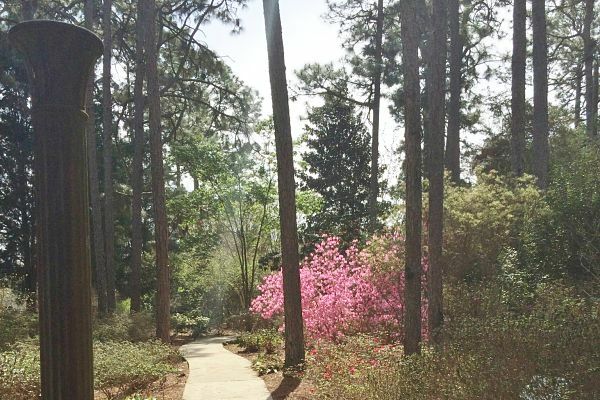 Azaleas play a role in the history and culture of the Mobile area and it is only appropriate that the Mobile Botanical Gardens pay homage to these gorgeous plants. While many of our garden areas contain azalea, they are more prominently featured in the Millie McConnell Rhododendron Garden and the Aromi Azalea Legacy Garden. The Millie McConnell Rhododendron Garden was named for one of the first members of MBG and a well-known and loved Azalean. This garden area has featured a mixture of evergreen and deciduous azaleas throughout the history of the Gardens and was extensively redesigned in 2006. Currently, a dense understory of evergreen azaleas blooms throughout the year beneath a canopy of mature deciduous azaleas and specimen trees. Against a background of longleaf pines, the azalea bloom season lasts from late February through July in a succession of color. The paths of the Rhododendron Garden sweep around large beds of hybrid groups and converge at a center plaza flanked by 19th century cast-iron columns which once graced now-demolished buildings in downtown Mobile. The hand-made brick pavers, donated by the City of Mobile Archives, once paved downtown streets. The Aromi Azalea Legacy Garden was developed in 2015 and is the newest garden area at MBG. 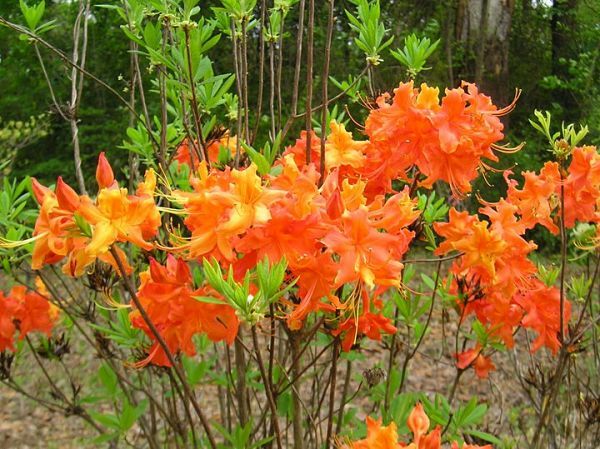 It features the extensive deciduous and evergreen azalea hybridizing efforts of the late Dr. Eugene Aromi, a native of Mobile. Pockets of deciduous azaleas are festooned with flowers from late March into late April among specimen shrubs and trees. Seasonal perennials are planted in great sweeps to draw your eye through the garden throughout the year. 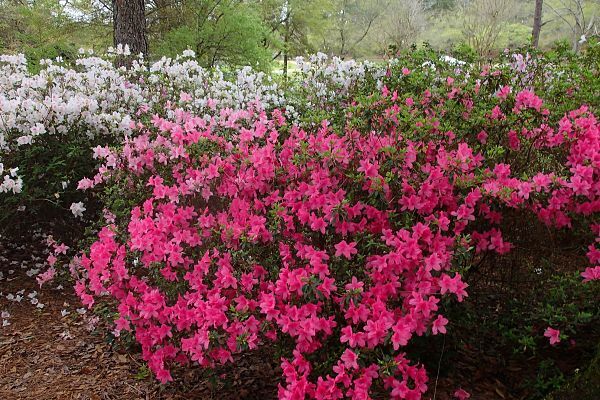 We don’t mind saying this is one of the most comprehensive azaleas collections along the Gulf Coast. Botanical Note: All azaleas are in the genus Rhododendron, which contains more than 2,000 species with many variations in size, bloom, leaf shape and color. But not all Rhododendrons are azaleas! Aromi Hybrids! Thanks to all who contributed! Robert Buddy Lee of Franklinton, Louisiana, developed this popular group of evergreen azaleas in the 1980’s. He crossed Rhododendron oldhami, a Taiwan rhododendron, with a wide range of evergreen azaleas to produce this beautiful group that bloom predominantly in the fall, as well as sporadic blooms throughout the summer. They range from 3-5ft tall and as wide. The national marketing of these plants by Jim Berry of PDSI in Loxley, Alabama, has brought these plants into the national spotlight. Our collection was donated by Flowerwood Nursery of Mobile. These are American satsukis hybridized by James Harris of Lawrenceville, Georgia in the 1970s and 1980s. They are medium to low growing plants with bright colored blooms during mid-spring. He has a soft spot for azaleas with rings of color on the outside of the petals and we have many fine examples of these in our collection. Classic examples of American satsukis that bring the intense colors and variations of the Japanese azaleas into the Mobile bloom season. Stripes, flecks and rings are characteristics of this collection. Colonel Pete Vines named this group after the town of Holly Springs near the University of Mississippi where he attended college. His aim was to produce evergreen azaleas with larger blooms, a dwarf to mid-size growth habit and increased cold hardiness. Some 84 varieties were introduced in the 1990s. This group represents the work of Dr. Eugene Aromi, Tom Dodd Jr, and Kosaku Sawada. 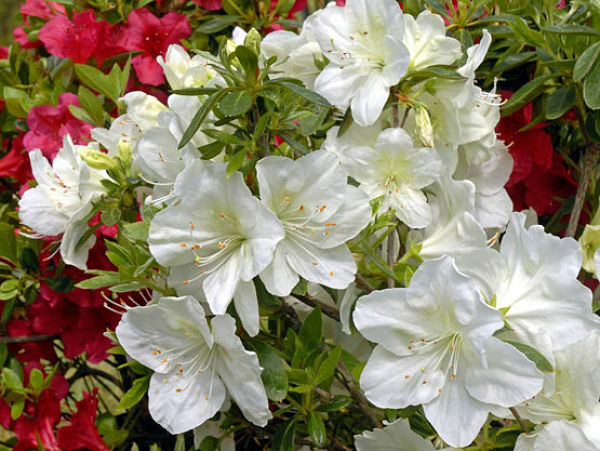 Their work with evergreen azaleas furthered the development of azalea hybridization in the United States, and helped establish Mobile as a center for azalea culture. 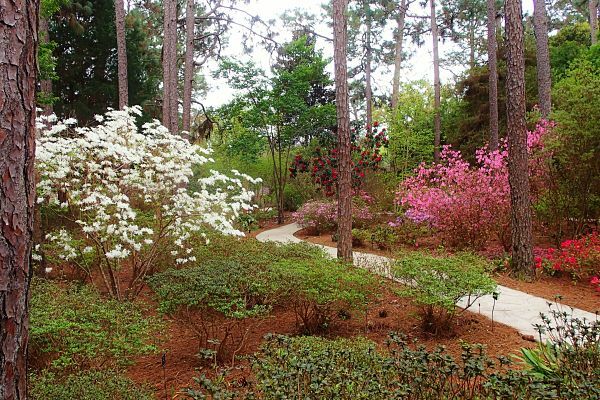 These standards of Gulf Coast Gardens display many different characteristics of bloom, variable sizes, and mid-spring displays. We are proud to display the achievements of these distinguished and world-renowned plantsmen. Kurume hybrids take a graceful, open form in the Southern Garden. The flowers are small, vibrant and profusely produced. They are among the first azaleas to flower in the spring. Dr John Creech of the National Arboretum brought this group from Kurume, Japan in 1976 and 1978. 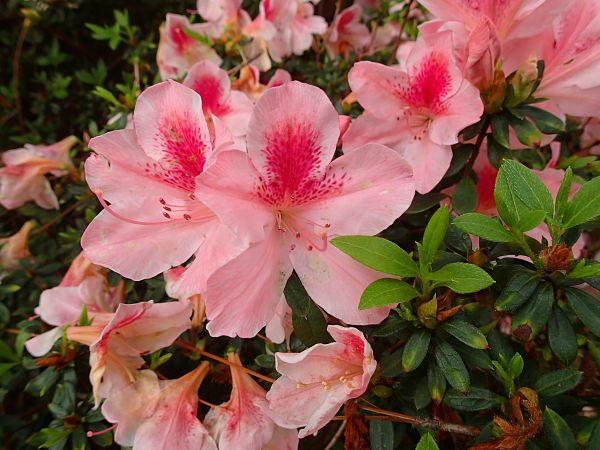 Nuccio hybrids are often Belgian florist hybrid azaleas crossed with satsuki varieties, resulting in low-growing azaleas with rich, saturated colors. Messrs Julius and Joe Nuccio began collecting and hybridizing azaleas in the 1930s at their nursery near Altabena, California – a business still in operation today. Many of the satsukis in our collection originated at Nuccio’s. 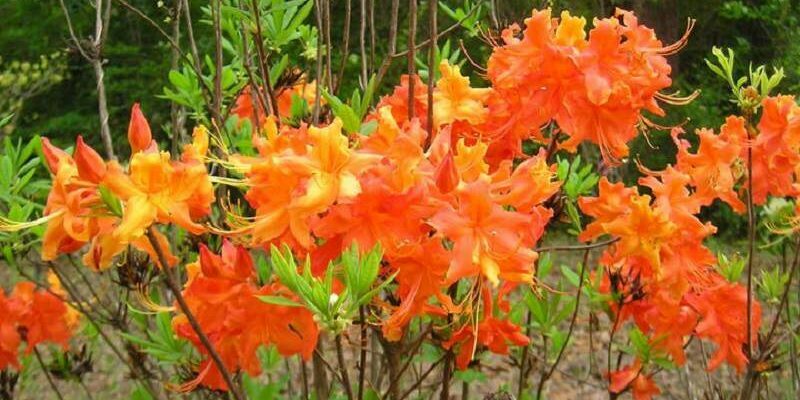 These azaleas have large flowers in pastel shades of orange, pink and white. Most have a low, mounding form, although some become large with age. In Mobile they bloom in mid-April. 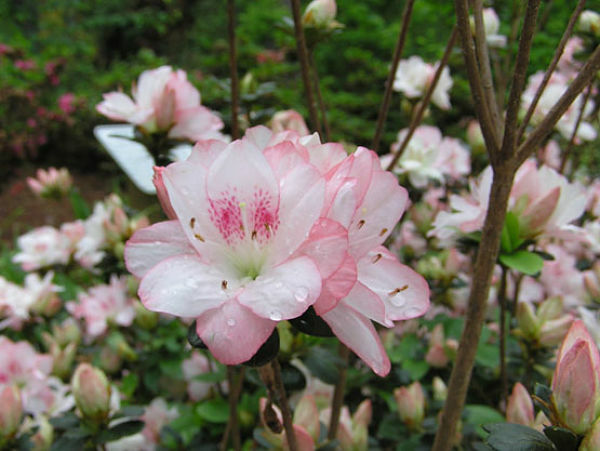 Robert Gartrell of Ridgewood, New Jersey, began collecting and hybridizing azaleas in the 1940s, and by the 1970s his Robin Hill hybrids were the first successful American satsukis on the market. Very familiar to Mobile, the Southern Indicas are typically the very large shrubs seen around town. Blooming in early spring, they reach 8-10ft tall and often wider. We have many rare varieties that were available at the time Bellingrath Gardens was developed, but they are difficult to find today. Fundraising was completed in 2015 for a new garden featuring Hybrid Deciduous Azaleas by Dr Gene Aromi of Mobile. The official opening of the new Garden Area was held on April 9th 2016 and is now open to the public. Although planted for future growth, there is a lot of color, scents and interesting companion plants to see! Please see Aromi Hybrids for a full description of this Collection. These are views of the Rhododendron Garden that have been posted on our Instagram account.